You are here: Home / Trading / You Have Options – What Is A Put Option? You Have Options – What Is A Put Option? If you can recall, during our last blog we explained what an option actually is. We also went into detail on buying and selling calls. Call options is only half of the story. Although for the majority of this blog we will be selling covered calls, it is crucial we go over what a put is. Simply put, don’t mind the pun, a put option is the direct opposite of a call option. If you can remember, a call option gives the owner the right but not the obligation to purchase 100 shares of the underlying security at the designated price. I’m not going to go into too much detail on call options, so if you need a refresher, or just didn’t read part one, check it out here. So, what exactly is a put option? Like I mentioned above, a put option is the direct opposite of a call option. A put option gives the owner the right, but not the obligation to sell 100 shares of a specific security at a certain price. Put options become more valuable as the stock decreases in value. This is because put options, at least out of the money put options, are ahead of the strike price. Why exactly would I want to buy a put? Puts generally are purchased when the investor feels that a market is going to decline. Remember, this time you have the right to sell 100 shares of the underlying security if you wish to exercise your option. Just like calls in the last blog, let’s go over some situations where you may or may not exercise your option. AAPL is trading at 108.06. There is a press release coming up in the next few weeks about Iphone sales and you believe the numbers will be less than pleasing. You think the news could potentially cause a 7-10 percent swing of the stock over the next month in either direction. But based on your research, you are betting a decline is more favorable than an increase. Now, for the purpose of this article we are going to ignore how stable a stock like AAPL is and assume it is fairly volatile. You purchase 5 AAPL DEC 105 puts at $1.47 per contract. 5 contracts costs you $735. $1.47 x 100 is $147 per contract, multiplied by 5. Your brokerage account has $735 deducted from it immediately. Over the course of the next month, AAPL drops drastically after reported sales of their new iPhone were subpar. The stock sits at $98 on December 16th and you decide to exercise your put option. Why are we exercising our option? If you remember from the start of the article, we are given the right to sell 100 shares of an underlying security when we purchase a put contract. The key thing is, we are given the right to sell them to the put seller for the strike price in the contract. Remember that in the stock market there is always a buyer, and a seller. Somebody sold us that put contract, and they did so knowing that they may have to purchase 100 shares from us upon expiration if we decide to exercise. We would purchase 100 shares of AAPL at the current price of $98, and then exercise our option. We would be selling these shares to the put owner for 105 per share. Let’s go over the profit on a trade like this. We will be ignoring commissions just to simplify things, but remember to factor these in when figuring your profits. Total profit on this trade is a whopping $2765 or a 376% ROI. If you’re already thinking ahead of the game, you can tell that selling put options can result in some large losses. If we were to write, or sell these options, we would be on the receiving end of this loss. Not quite as drastic because we would collect our option premium of $735 selling these puts,but a loss nonetheless. It is important to be 100% educated before you step into the markets. 5 contracts again costs you $735. Over the course of the next 3 weeks, AAPL shares actually only take a minor hit from the news report of poor sales and the stock sits at $105.50 at expiration. Your put shares would expire worthless and you would lose your $735 from purchasing these puts. This is your maximum loss in a situation like this. AAPL shares take a decent hit and fall to $104 at expiration. Our put option is in the money, but by very little. Is it worth it for you to exercise your option? Lets check. If the online trading world was free, we would lose $235 on a trade like this. We would still exercise our option as a $235 loss is better than losing our whole premium of $735. Not bad, considering our research showed us that this stock had a very good chance of dropping to the point where our puts would be profitable. You can’t be hard on yourself for not being right every time. But unfortunately, trading options is not free. Let’s factor in commissions. Questrade charges $24.95 per contract to exercise, and 1 cent per share, up to a maximum of $9.95 per trade. Our 500 shares of AAPL would cost us $5. Check out Questrade commissions here. Commissions : $24.95 per contract to exercise, times 5 contracts. $5 for stock purchase. Total commissions would be $129.75. Add this to our original $235 loss on the trade and we lose a total of $364.75. This option is still worth exercising, as we can recover some of the premium we spent buying the puts, but only around half. So I know what to expect when buying a put option. But what if I want to sell a put? One of the biggest mistakes new investors make when trading options is they get the thought in their head that calls mean you are bullish and puts mean you are bearish. This could not be farther from the truth. Selling puts is a bullish strategy, and thus selling calls must be a bearish strategy. When I am selling puts, what exactly am I expecting? Selling puts is mainly a bullish strategy for one reason. You are hoping the underlying security of the put you have sold goes up. Why? As we stated at the start of the article, as the price of a security goes up, the value of a put option decreases. You are hoping the security goes up because you are the writer of this put, and you’d like the options to expire worthless. I use the word hope lightly. As an investor, you should never be relying on “hope” in your investments. If you’re not confident in a position, do not enter it. What are the potential profits of selling a put option? Selling puts is not going to make you a fortune overnight. In fact, selling puts comes with extremely limited profitability. The maximum gain you can make by selling a put is simply your premium for selling the option. The maximum loss however, could be drastic. If we are writing puts in a situation like this, remember we are bullish on AAPL. So you can probably guess who is going to be buying these puts, people who are bearish on AAPL. Lets take advantage of this and make some money. We feel with the findings in our research that Apple’s press release about the IPhone sales will cause the stock to rise. This is a great opportunity to profit from those who are either not informed or have made grave mistakes in their findings. We are not certain, but confident that the stock will increase 7-10 percent over the next few weeks after the press release. We decide to sell 5 AAPL 110 Dec puts. 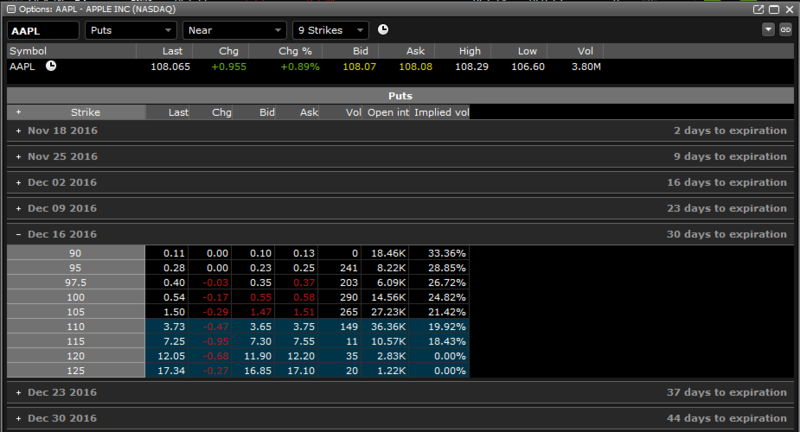 As you can tell from the options table above, these puts would sell for about $3.65, or $365 a contract. This premium is currently high because the option is currently in the money. In order to profit, we need AAPL to increase from $108.06 to at least $110. Over the course of the next month AAPL rises to $113.50 at expiration. Your put options you sold would expire worthless and you would profit $365 dollars multiplied by 5 contracts, or $1825 dollars. Not a bad return for doing nothing but write the put. But it’s easy for an options trader to make a few of these trades and think he is bullet proof. There can, and will be losses. Lets see how this could go the other way for us. We still decide to sell 5 AAPL 110 Dec puts for $365 a contract. We collect $1825 dollars in premium. Over the course of the next few weeks AAPL price actually drops significantly due to sales from their new IPhone being sub par. The stock sits at $100.50 at expiration. Your 5 contracts are exercised by the put purchaser and you are required to buy 500 shares of AAPL from them. Remember, you are the put writer(seller). What this means is you are obligated to fulfill that options contract if the put purchaser decides to exercise. The purchaser has the right to sell 100 shares of AAPL at the strike price. You as the writer, must purchase those shares from him. You just took a $2925 loss over a very short period of time. Obviously not the optimal result, but our scenarios here are in a vacuum so to speak. There are many things you can do to prevent losses like this if you fear your current investment is not going to be a profitable one. Limiting losses is something every investor needs to learn, as none of us make profitable trades 100% of the time. Another thing to note is although you have purchased shares for $2925 over market price, you at least own AAPL shares, and a recovery could potentially happen. It is often a good idea to write puts in stocks that you actually wouldn’t mind owning in case of a situation like this, but profit should be your number one goal.